Chloe Shell, a Covington native, is the new athletic director at Mississinawa Valley High School. 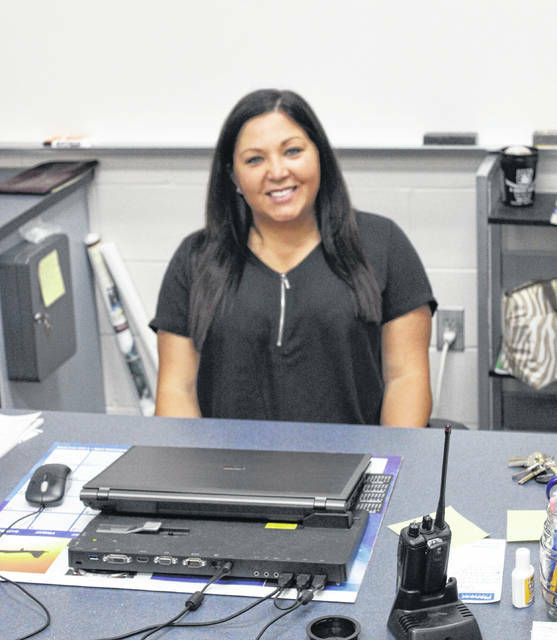 UNION CITY – It’s been a couple of weeks now since Chloe Shell took over as the new athletic director for Mississinawa Valley, and despite the rush of getting ready for the fall high school sports season, things have gone pretty smoothly, she said. Much of that is done now with school about to start next week. She also took time during picture day her first week on the job to meet with all her fall coaches. Shell replaces Mike Griffin, who was the head football coach for three years and athletic director for two. He left in June for a new position at Preble Shawnee. Steve Trobridge, an assistant coach under Griffin, is the new football coach. The transition was not as difficult as Shell thought it might be with coming in so late in the summer. “Everything honestly has gone pretty smoothly,” Shell said. “There haven’t been any real challenges yet. There have been a few hiccups, of course, but nothing too major. I’ve had a lot of help in making the transition smooth. I talked to Mr. Griffin a couple times about some things and he was very helpful. For Shell, getting the job no matter how late in the year it came open is a dream come true. “It just came up out of no where,” said Shell, who was all set to go back to Ohio Wesleyan College as an assistant softball coach. “I always new I wanted this job, but the timing was never right before. I was content on going back to coach softball when I heard about the opening. Shell said she heard of the job opening from a friend, although she didn’t believe her at first. Once she realized the job really was available, she said she sent in her resume in 10 minutes. “I enjoyed my times at Ohio Wesleyan,” Shell said. “It was great there, but this is an opportunity I just couldn’t pass up. Shell is no stranger to the athletic director’s office, however. While at Covington, she was an aid to then athletic director Roger Craft. “I did a lot of the smaller things like filing paper work, printing out award certificates and stuff like that,” said Shell, who went onto Bluffton University after she graduated from Covington. “I went to Bluffton with the idea of becoming an English teacher, but I realized it wasn’t the right thing for me so I decided to do what Mr. Craft did. The Daily Advocate sports editor Skip Weaver can be reached at (937) 569-4316 or by email at sweaver@aimmediamidwest.com. You also can follow him on Twitter at @skipweaver65. This entry was tagged Blackhawks, Bluffton, CCC, Chloe Shell, Covington, Doug Dunham, Jeff Winchester, Mike Griffin, Mississinawa Valley, Ohio Wesleyan. Bookmark the permalink.